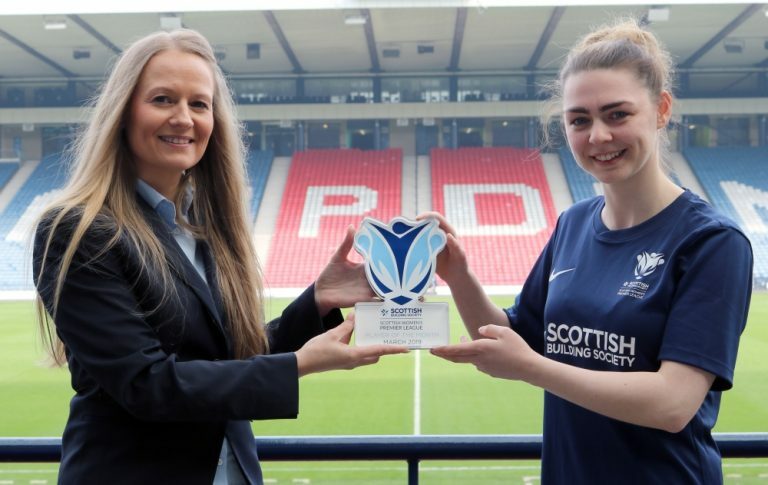 The winner of the Scottish Building Society Scottish Women’s Premier League 2, Player of the Year was awarded to Motherwell captain Suzanne Mulvey at the recent SWF Awards night, at the Hilton Hotel in Glasgow. The Scotland international cap led ‘Well to the title, amassing a record points tally along the way. She also led her team out at the Scottish Cup final in her first season with the club. Although she was happy with her season, she was still surprised to win the award. “It wasn’t expected. The other girls in the category were all great and I was delighted to be in along with them”. The ‘Well forward chalked up 26 goals to lead the way in the final top-scorer standings, giving her a second award on the night. “I wasn’t expecting to get an award for being top goal-scorer so to get two awards was just amazing”. Suzanne also took time to praise the organisers of the awards. “The team did a fantastic job putting it together. Everything from the set-up, the lay-out and the people they had speaking was brilliant and really well planned”. It shows the progression of the game to have a big event like that and everyone there came together like a community”. The awards evening also provided the opportunity for players to get together off-the-field. “I don’t always get to spend time socially with the team and it was great chance to do that alongside players from other teams too”. Motherwell boss Eddie Wolecki-Black brought Mulvey to Fir Park in January and she was full of praise for her boss. “I had played under Eddie previously and I’ve never learned so much from a manager. His attention to detail is unbelievable, he analyses everything and is so good at getting extra out of players, he certainly got more out of me”. It was pretty clear to Mulvey from the start that the focus was going to be on winning the league. “As soon as the call came from Eddie and we talked about me joining, the message was that Eddie was there to win the league. Right from the very first training session I knew what the focus was and I just wanted to do all I could to help Eddie on the journey”. The title victory came to fruition of course and it provided the main highlight in a season of many at the club. “The league win was obviously the highlight and we were delighted with the Scottish Cup run up until the final. Also, the likes of Emma Black coming back from some time away was just fantastic for us”. Mulvey’s experience in the game led to Wolecki-Black naming her captain ahead of her first campaign, something which she was very proud of. “Individually, it was a big thing for me to be named captain, I’ve never been captain of any of my previous teams. I didn’t feel I had to change my character, I’ve always been motivated to push other players on and set a good example”. Being named a captain for the first time may cause some players some added pressure but Suzanne didn’t see it that way. “There was no extra pressure being captain although there is an extra focus on you. We’ve got a good group of players and everyone rose to the challenge of pushing ourselves and putting Motherwell on the map in women’s football”. As her thoughts turn to the new season, Mulvey is confident in Motherwell’s ability to cope with the step up, whilst being realistic about their targets. “First and foremost, I think this goes for all newly promoted teams, we need to stay in the league. As the season goes on it’s just a case building on the journey as the season goes on”. It appears that winning her Player of the Year award has given Suzanne an added impetus ahead of the new season. “As soon as I walked off the stage after getting my award, I wanted to do it again. That’s just how my mind works, it will motivate me to do even better. I gave myself a few weeks off and I’m back training hard now”. So, has being captain and one of the more experienced players at Motherwell, as well as working with Eddie Wolecki-Black, given Suzanne any thoughts on a future in coaching? “I wouldn’t ever want to not have football in my life. I’ve really enjoyed working with the younger players and giving them pointers to help them develop. 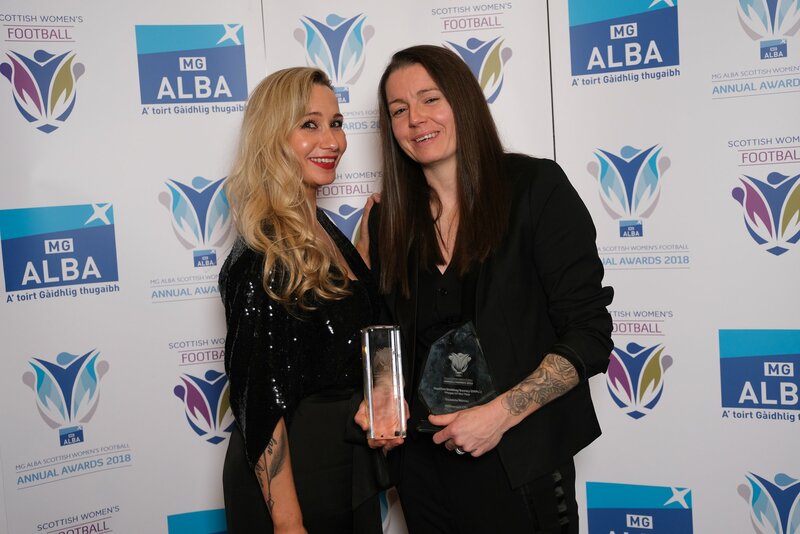 I remember playing against and alongside people like Pauline Hamill and Shelley Kerr and learning from them and it’s great to see them do so well in their coaching roles now, so it’s something I would like to do”.